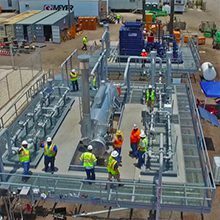 Aspire Energy provides Combined Heat and Power (CHP) technology, a clean and efficient way to generate power and steam through a single natural gas fuel source. Onsite generation of electrical and/or mechanical power. Waste-heat recovery for heating, cooling, dehumidification, or process applications. Seamless system integration for a variety of technologies, thermal applications, and fuel types into existing building infrastructure. CHP is not a single technology, but an integrated energy system that can be modified depending upon the needs of the energy end user. With a CHP unit, the heat produced while electricity is generated is recovered for numerous thermal applications, such as boiler water preheating, air conditioning or humidity control. CHP captures energy that would normally be lost in power generation and uses it to provide heating and cooling, making CHP 75 to 80 percent efficient at using fuels. CHP can be designed to provide high-quality electricity and thermal energy to a site regardless of what might occur on the power grid, decreasing the impact of outages and improving power quality for sensitive equipment. Natural gas CHP equipment can lower your total operating costs with viable heat recovery options. CHP equipment delivers reliable, high quality and secure power with recoverable waste heat capabilities. 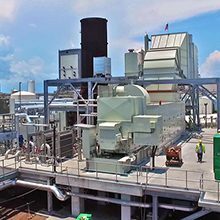 In June 2016, Chesapeake Utilities Corporation commenced operation of its Eight Flags Energy Combined Heat and Power Plant on Amelia Island in Nassau County, Florida. We developed a state-of-the-art CHP plant on a site adjacent to Rayonier Performance Fibers, LLC, a subsidiary of Rayonier Advanced Materials. The CHP Plant operates with a Solar Turbines Titan 250 gas turbine generator set coupled with a Rentech heat recovery steam generator. 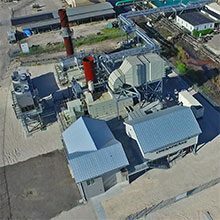 The CHP Plant generates electricity, producing an average 20 megawatts of base load power that is sold to Chesapeake Utilities Corporation’s subsidiary, Florida Public Utilities (FPU), for distribution to its retail electric customers. Steam and hot water generated from the waste heat of the CHP Plant’s turbine is sold to Rayonier Advanced Materials. Uses environmentally friendly natural gas. Provides on an average 50 percent of Amelia Island’s electric requirements. 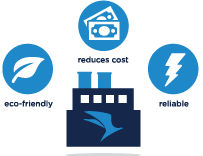 Reduces energy costs to yield a savings of $28.M to electric customers over a 20-year term. Provides financial benefits to the local economy. Improves Amelia Island’s electric system reliability and reduces the risk of extended major storm-related outages. CHP is the use of a heat engine or power station to simultaneously generate electricity and useful heat from a single energy source, such as natural gas, biomass, biogas, coal, waste heat or oil. CHP is an efficient and clean approach to generate electric power and useful thermal energy in one energy efficient step. According to the American Gas Association, natural gas is the preferred fuel choice for existing CHP systems that reliably serve the energy needs of commercial and industrial facilities at costs up to 50 percent less than traditional, separate production of electricity and heat.